MYTH: Shut Up Industries is a Fortune 500 company that pads the already-stuffed pockets of its “fat cat” executive owners, Gina and Patty. FACT: Shut Up Industries is not a Fortune 500 company, though with our shaky management team, weak profit margins, and poor leadership styles, we fully expect to crack the MisFortune 500 list later this year. As those who read our annual report know, our compensation packages are limited to going to lunch frequently (“We love lunch”) and saying the phrase “shut up” any time we want. MYTH: Shut Up Industries has a full-service, world-class Shipping Department. FACT: Sadly, this is no longer true. After our beloved mother passed away and went to the Shipping Department in the Sky, our Senior Shipping Department disbanded. Fortunately, we were able to find cheap labor in Gina’s house with her 14-year-old daughter. (“Emmy, if you ship this package for me, I’ll let your friend sleep over.” ) To receive a package from the new Teen Shipping Department, visit the Shut Up Store. Then say a prayer that it actually gets there. MYTH: Patty and Gina’s full-time jobs are running Shut Up Industries. FACT: Though they would love nothing more than to work for the company that both allows and encourages them to make mistakes and meet caring compassionate people, both Patty and Gina have full-time jobs. Patty works as a Family Partner and Gina as a freelance copywriter out of her house, where she ignores laundry and other domestic matters daily. MYTH: Patty and Gina just have a blog, book, and Facebook page because they are attention-seeking narcissists. FACT: Though we readily admit that we like the fact that we have people who actually listen to us (something that rarely happens at home), we maintain and manage our blog and social marketing sites with the intent of allowing special needs parents to get free support and therapy. If we were truly narcissists, we would talk about ourselves in the third person. Patty and Gina never do that. MYTH: Patty and Gina are making things up; they both are perfect. 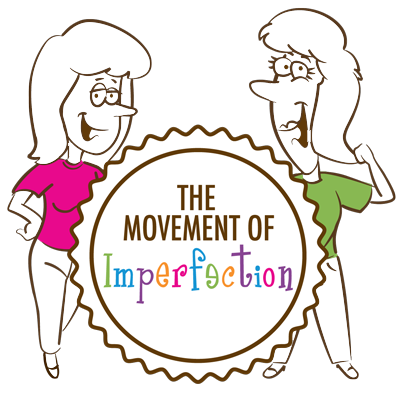 MYTH: The Movement of Imperfection is telling special kids that they are imperfect and not whole. MYTH: Patty and Gina are writing another book. FACT: It is true that we have taken a break from our routine writing (check writing) and are working on a new book that celebrates mothers, in honor of our late mother. Our goal is to put aside our daily distractions and procrastinations so that we can finish it before we become late mothers. We hope this clarifies some of the myths that are circulating. If you have a question about Shut Up Industries or about Patty and Gina, which doesn’t involve our weight or IQs, please feel free to ask us. Shut Up Industries, LLC. Equal Opportunity Imperfect Non-Employer.